Light scattering can be a useful, n ondestructive approach for characterizing macromolecular mass and sometimes shape. As a laser beam passes through a sample, a small amount of the light is scattered in all directions with the scattering intensities and angular dependence a function of the molecular weight and shape of the molecule. 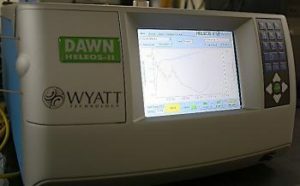 The DAWN HELEOS II multi-angle laser light scattering (MALLS) instrument simultaneously measures the average intensity of light scattered at various angles from the beam. The result is a nearly instantaneous measurement of the weight-average molecular weight (Mw) of all macromolecular species present in the sample. Mw is the same thermodynamically rigorous molecular weight as measured in sedimentation equilibrium experiments. MALLS provides rapid information on Mw at a single concentration, but sedimentation equilibrium on a single sample can reveal the concentration dependence of Mw (e.g., resulting from self-association). MALLS measurements as a function of concentration, leads to another thermodynamic parameter the second virial coefficient, which is a measure of the interactions between the macromolecule and its solvent. If the size (i.e., radius) of the molecule in solution is >~1/10 of the wavelength of the laser, the angular distribution of scattering measures the radius of gyration of the molecule. The radius of gyration is rigorously defined and can lead to structural insights by comparison of the measured value with those calculated for various shapes. The hydrodynamic radius (Stokes radius) as measured by sedimentation velocity or dynamic light scattering is that of an equivalent sphere and contains contributions from mass, shape and bound solvent the latter making shape inferences more difficult. MALLS provides a rapid approach to the measurement of Mw over a wide range of molecular weights. The second virial coefficient is easily obtained, and in some instances a direct measure of molecular shape is possible. MALLS generally requires more material than do sedimentation methods. MALLS can be useful as a relatively rapid approach for characterizing proteins and for investigating macromolecular associations.